Treasure the everlasting beauty of Mother Nature's works of art. Wings of Imagination offers the opportunity to own the beauty of butterflies dramatically displayed in airtight, clear acrylic cases. Sealed in these finely crafted cases, protected from harm, the butterflies achieve immortality. The craftsmanship of the cases is unmatched in the industry. For the past 23 years artist Sam Trophia's creative imagination has translated the butterfly world into an endless variety of compositions. Sam's creations have transformed corporate and residential walls into kaleidoscopic spectacles of natural color and beauty. The GalleryWith displays proudly shown nationwide, such as those in Butterfly World, the Audobon House, the Design Center of the Americas, art galleries and countless homes from coast to coast. Sam has spread his art far and wide, recreating the choreography of the butterflies in flight; a splendid chaos of silent winged jewels displayed for a lifetime. The range of colors, the diversity and brilliance, pattern, and color exhibited in the perfectly crafted displays surpasses even the natural habitat of these magnificent insects. The multitude of wall and table mounted displays range from the solitary beauty of a single specimen to complex wall murals consisting of multiple display cases depicting an infinite variety of butterflies suspended in mid-flight. Custom work is limited only by the imagination! Every piece is a perfectly unique object of art complete with butterfly identification packet, artist biography and instructions on caring for your natural wonder. Raised in select butterfly farms from South America, Africa and Southeast Asia, these "wings of wonder" have completely lived out their short adult life cycles. They stand as testament to the incredible diversity of the tropical rain forest and the importance of mans's need to preserve their fragile habitat. Sam TrophiaAt 9 years of age, Sam Trophia witnessed the incredible transformation of a homely caterpillar into a beautiful Monarch butterfly, which forever captured his interest in the butterfly world. By the age of 15, he was studying and raising Monarch butterflies in upstate New York. In 1975 he collaborated in a research project to band butterflies resulting in the understanding of the annual migration patterns of the Monarch from the eastern half of North America to their over-wintering sites in Mexico. From hobby and science to fulfilling a lifelong dream, Wings of Imagination - The Butterfly Gallery, became a reality in 1992. 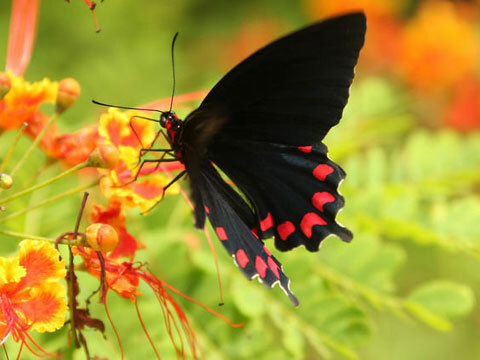 The culmination of over two decades of fascination, love, and appreciation of the beauty of the butterfly, the gallery is one of the most spectacular spots to visit in Old Key West. Whether you visit us exclusively here on our website, or plan to enjoy the beauty of our two locations in Key West, we welcome you. Through our art form you have the potential of enjoying the tranquil beauty and the wonderful masterpieces of Nature's creation suspended in flight, preserved for all time. Special orders and commissions for original one-of-a-kind display creations are always welcome. Worldwide shipping is available.